Sometimes I find myself taking the same photo over and over again. I definitely have my favorite places to go, and when I’m not intentionally doing something differently, habit leads me to frame that same photo yet again. To combat that, and to push my photography, I’ve been trying two things: finding someplace new to take photos and framing my photos in intentionally different ways. 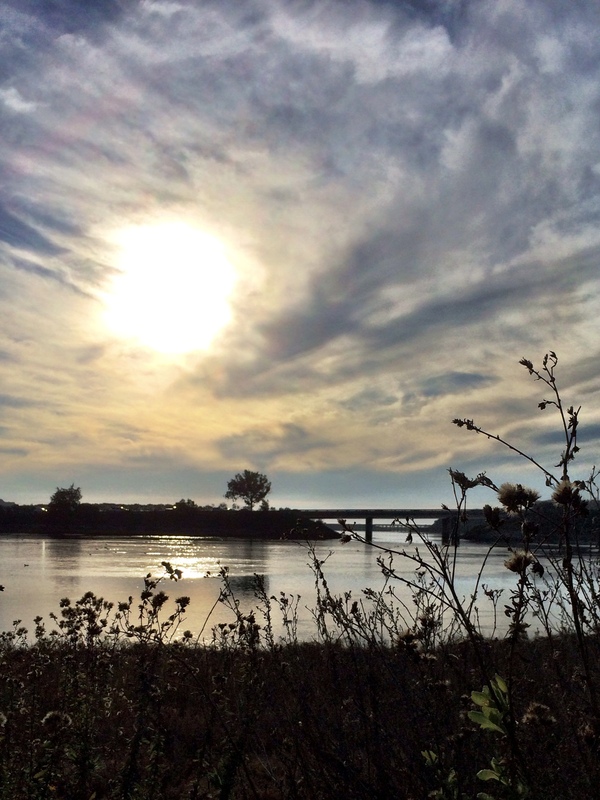 I stopped by the San Elijo lagoon yesterday and snapped a few photos near sunset. 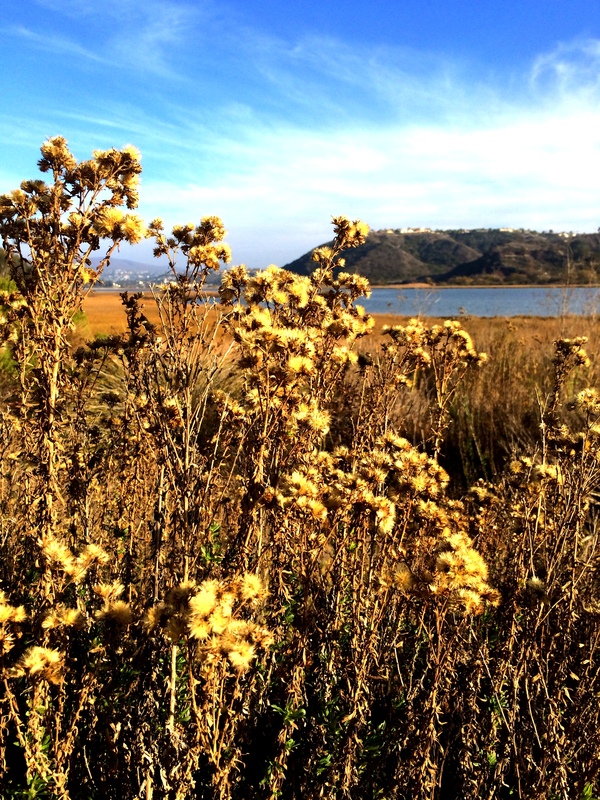 Today we headed off to the Batiquitos lagoon–a place we seldom visit–to walk the trails and take photos. Heading west, we took a trail over a small bridge and found ourselves on a mucky path, slick with mud and wet sand. We trudged on for a while until we got to a place where we could only pass by climbing rocks. But along the way I had noticed the pickleweed, a specially adapted plant that thrives in the brackish water of the lagoon. It’s often green, but today it was gorgeous with vivid pinks and reds. 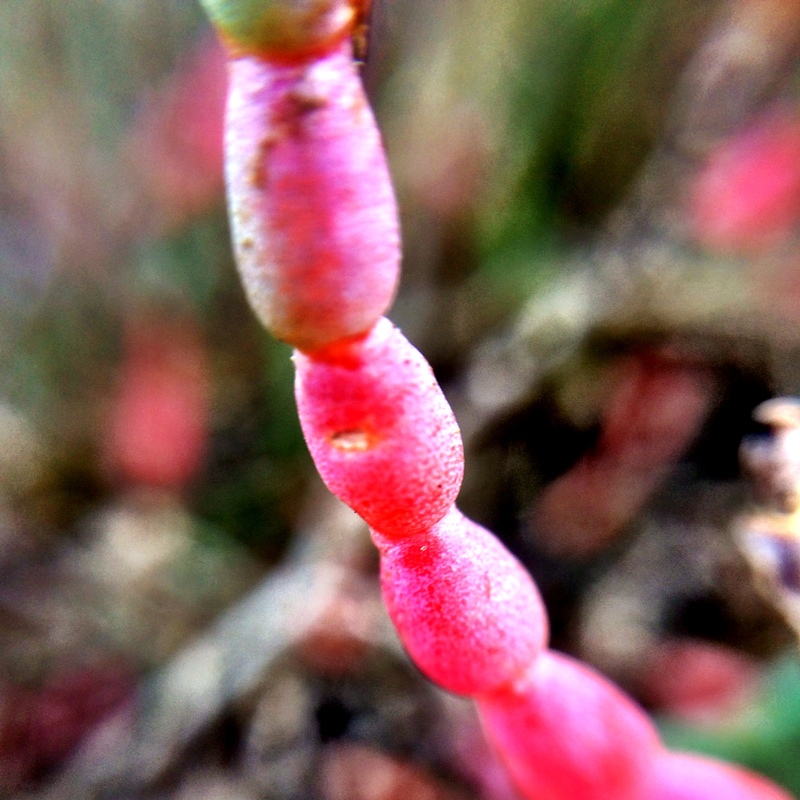 I got out my macro lens and leaned in close to capture the pickleweed. And as long as I had the macro attached, I took photos of other native plants including salt grass and whatever this plant is. Heading back to the east, we found the drier part of the trail and walked with many people and their dogs in the sunny mid-60 degree weather. 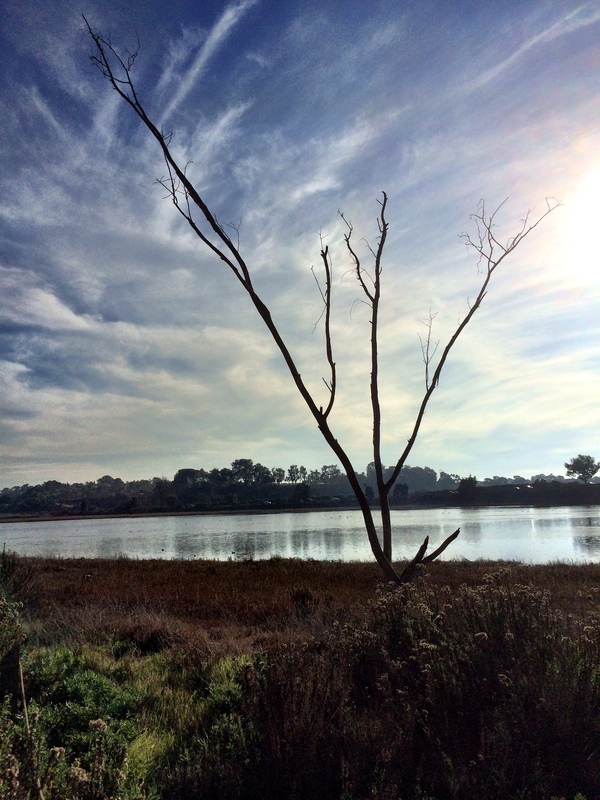 We spied an osprey high in a eucalyptus tree overseeing the lagoon. Ducks paddled and dove down into the briny water for a mid-day meal. I love the way this lagoon plant almost looks like cotton with puffs exploding from it. I worked to photograph the lagoon with this plant in the foreground and the sun over my shoulder, framing the water with the plant instead of shooting over the top of it. Bare trees are uncommon around here, so this one caught my eye. Instead of focusing my camera on the tree branches, I worked to see the lagoon through the tree, capturing the wispy white clouds and the shine of the water’s surface behind it. Shooting toward the sun created the silhouette-like sharpness of both the foreground and the background. As we were leaving, looking toward the northwest, the sun was a bit off to the side as I tried to frame this image of the space where the freeway passes over the lagoon. I knelt, pulling the brush into the image as I looked out to the ocean. You can see the fog beginning to gather along the coast and if you look closely you might even notice the many ducks floating on the current just beyond the brush. And as an added bonus, we got in a nearly two mile walk in the fresh, salty air on our quick photo expedition! 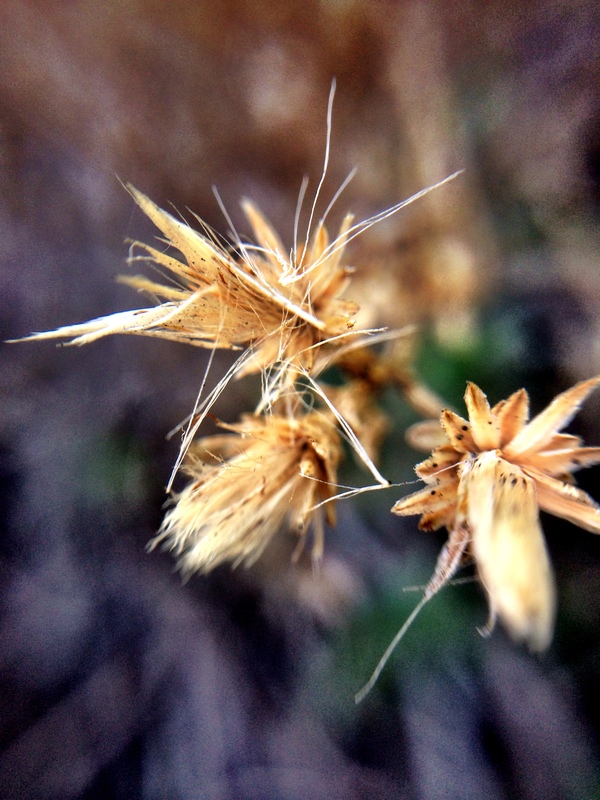 This entry was posted in nature, photography and tagged Batiquitos, iphoneography, lagoon, learning walk, macro, photo essay, photography on January 4, 2014 by kd0602.